The England women football team beat Croatia 3-0 which means they automatically qualify for the EURO 1213 in Sweden. This also means that they have topped their touch group (group six) having beaten Netherlands, Serbia, Slovenia and Croatia. Hope Powell the England Manager, who also doubled up as Great Britain’s coach in the London Olympics, is over the moon that her girls have secured a place in next year’s European Championships. The win over Croatia was not entirely expected by bookmakers because Croatia had beaten England back in March. The players knew it would be a tough game, but they upset the odds by pulling off a massive win. The first half was very frustrating for the England team, they had a good few chances of scoring but they found it difficult to break through Croatia’s great and well organised defence. However, half way through the first half midfielder Jill Scott managed to tap in a goal their 1st goal which calmed everyone’s nerves, startled the Croatians, and helped move the English girls into a higher gear! Possible post half-time nerves were put to bed when two minutes into the second half Striker Enjola Aluko managed to score the 2nd goal. She also received a well-deserved player of the match award and got given the customary huge bottle of champagne. 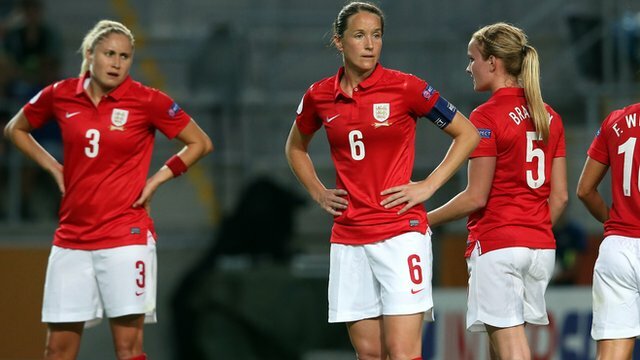 The third goal came from trusted Captain Casey Stoney who scored late in the second half ten minutes before the end. This made a triumphant score of 3-0, and sealed victory for England. The women worked very hard in training and this was shown on the pitch. They now have to concentrate and get focused for next year. Once again they will be traveling to the Euro’s with high expectations. 5,821 people came to watch the game at Walsall. When the England team walked off the crowd gave them a very enthusiastic loud cheer. This number is only a fraction of people compared to the amount of supporters who attended the Olympics to support team GB women’s football. Powell seemed pleased with the attendance but was hoping after the Olympic Games it would enhance the profile of women’s football.